O Bharadwaja! The knower of all the Vedas and the Vedangas! Your radiance is like a huge fire that is capable of burning all my sins. The ancient Ṛṣis of India knew the Ultimate Reality precisely. They are often known as the progenitors of mankind. It is through their spirits, which flowed like the fountains, that our Vedic culture got its life. They rendered great contribution to the mankind by revealing the Vedas to us. One among such Ṛṣis is Sage Bharadvāja who worked for peace and harmony throughout his life. He was an embodiment of Vedic wisdom and science. He authored Vimāna Śāstra, a treatise on the making of aircrafts and spaceships. 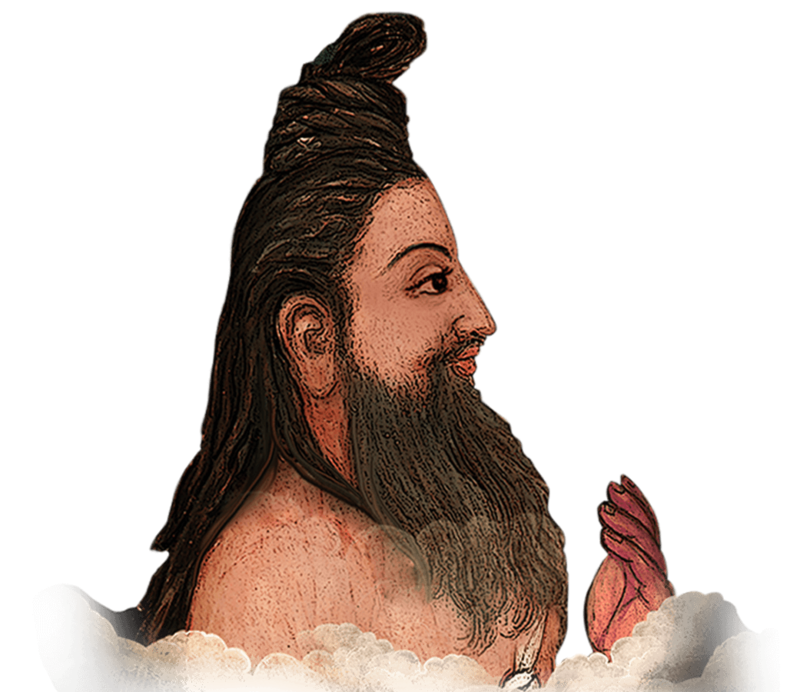 The Vedic literature, mainly the Purāṇas and the Ṛg Veda, has his significant contribution, which plays a major role even today in providing greater insights to the society. The wise sage was born to Sage Brihaspati, the preceptor of the Devas, and was later adopted by King Bharata, the son of Śakuntalā and Duṣyanta. King Bharata found him on the banks of River Ganga, shining with radiance. He heard a celestial voice that told him that the child was a divine being. Hence, the king took the child with him and thereafter brought him up with utmost care and affection. The sage was a legendary warrior, and he was the father of Droṇāchārya, who was the royal preceptor of the Kauravas and the Pāṇḍavās. Sage Bharadvāja’s immense knowledge had no boundaries and was growing limitless. Ever since he was young, he engaged himself in learning the Vedas. Even though he had acquired immense knowledge, his thirst for knowledge remained unquenched. He then decided to please Lord Indra in order to obtain more knowledge by performing severe penance. Nothing would deter him as he was performing the penance for years, without food and water, and his body began to wear out in course of time. Finally, pleased by his penance, Lord Indra manifested before him with three enormous mounds of effulgence, which are nothing but the three Vedas. The Vedas were originally three in number until Vyāsa classified them into four. From each of these three mounds, he picked up a handful and offered them to Bharadvāja. The three mounds of radiance merged with the body of Sage Bharadvāja who shone with greater effulgence like never before. Lord Indra then instructed the sage to enlighten the beings in the world by imparting to them the knowledge he had acquired.Thereafter, Sage Bharadvāja served as a guiding light to the people by imparting the knowledge of the Vedas to them. Once the sage went to Kailāsa to meet Bhṛgu at his hermitage. On his way to the hermitage, he witnessed poverty everywhere. People were in an impoverished state, and they lived in constant fear from hordes of demons named Vārshika and Shāmbara, who were tormenting the beings by butchering and slaughtering them mercilessly. The rulers feared the demons too and failed to protect their kingdoms. Looking at the dire situation, the sage sympathized with the people. He then contemplated on the proper course of action and decided to render his service to the people with all his power. He then advised the people to acquire the knowledge of the Vedas and to tread the path of Dharma (righteousness), and he instructed the warriors to fight against the demons who tortured the beings. His proclamation spread everywhere. He built a hermitage on the banks of River Saraswati where people thronged to listen to his discourse on the teachings of the Vedas every day. Even the kings visited him to seek his counsel in the administration of the kingdom and offered him cows and other valuable materials, required for the Vedic rituals, as gifts. He then became the preceptor of the kings, Abhayavarti and Divodāsa. Meanwhile, the demons continued with their atrocities. They invaded the kingdoms of Abhayavarti and Divodāsa, interrupting the Vedic rituals, and plundering and looting the properties of their kingdoms. The demons possessed mystical power with which they could shield themselves from the arrows with an invisible protective armour. King Abhayavarti and King Divodāsa fought against the demons but were defeated by them. They then sought refuge in Sage Bharadvāja who grew furious that they could not fight back the demons and protect their own people. Since the demons had plundered their kingdoms, the kings had no wealth to buy weapons and armours for their soldiers in order to destroy them. Analysing the grave situation, the sage did penance to please Lord Indra who blessed him and asked him to seek the help of the Aśvini Kuāmrās in obtaining wealth to procure weapons and armours needed for the soldiers. Thus, with the help of the sage, the kings Abhayavarti and Divodāsa defeated the demons. They then arranged a grand celebration to commemorate their victory over the demons and honoured Sage Bharadvāja by offering him heaps of pearls and diamonds. The sage refused to accept the offer as he was a sage who lived in the forests and he wouldn’t require such wealth. Even the Devas assembled there and requested the sage to accept the offer. The wise sage accepted the wealth but distributed it to the people who were impoverished. Subsequently, the sage continued to help many kings to vanquish the demons who tormented the people, and he also continued to spread the knowledge of the Vedas to the people in his hermitage until he attained the higher realm, known as the Saptarṣiloka.